Identifying the need to promote age-friendly employment practice, the Wan Chai Methodist Centre for the Seniors organized the New Employment Journey for Senior Citizens programme that aims to enhance employment knowledge and skills and to create employment opportunities for middle-aged and older job seekers. The programme was supported by the Jockey Club Age-friendly City Project and implemented in collaboration with the District Council and several social enterprise and district older adult centres. The programme organized 20 hours of training that provided job seekers the latest employment information and equipped them with job searching and interview skills. Some interested participants further enrolled in a placement-tied course in catering service or office support. The course in catering service equipped them with basic knowledge of food safety and hygiene, skills as waiters/waitresses, and practical Mandarin and English. The components of the course in office support included handling phone calls, operating office equipment, filing, performing outdoor duties, and practical English and Mandarin. Following the practical job training, trainees were matched to a 40-hour placement that further enhance their job skills and employment opportunities. A job fair was held and provided a platform for elderly job seekers to get employment information. Twelve organizations set a booth in the job fair that allowed elderly applicants to have on-the-spot interviews. 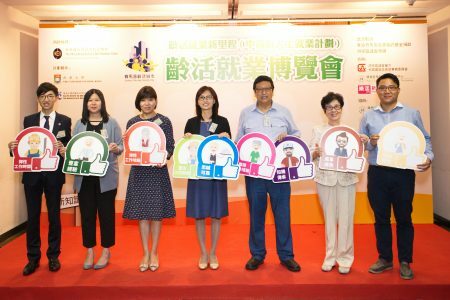 How collaboration worked: The programme was one of the district-based programmes under the Jockey Club Age-friendly City Project, which has been initiated and funded by The Hong Kong Jockey Club Charities Trust. The programme was co-organized by the Community Building and Housing Affairs Committee of the Wan Chai District Council, Happy Retired, Methodist Southorn Centre for the Elderly, Buddhist Cheung Miu Yuen Neighbourhood Elderly Centre, Baptist Oi Kwan Social Service, and Harmony Elderly Centre. Details on older people's involvement: Older adults who were seeking employment were the target participants of this programme. Some older adults assisted the organizer in running the job fair as volunteer helpers. Both quantitative and qualitative evaluations were conducted to analyse the programme impact. Most of the participants agreed that the programmes improved age-friendliness in civic participation and employment and communication and information. Participants also reported significant positive change in sense of community (need fulfilment sub-scale), attitude towards older people, and quality of life. Most of them were satisfied with the programme content and arrangement and all of them would recommend the activity to their friends and family. The focus group study revealed that participants found the internship experience enjoyable and stimulating. They appreciated that they were given the placement opportunity and challenging work tasks. They built up their confidence by demonstrating their capability. Despite of their positive experience, many of them thought the employers would be unlikely to hire older workers. Participants of the job fair perceived enhancement of age-friendliness in the target domains and expressed moderate to high level of satisfaction with the programme. Feedback from the primary target group: -	Placement exposed participants to stimulating work tasks and to improve their interpersonal skills. -	Participants gained work satisfaction through successful completion of work tasks and gaining trust in the workplace. Since many of the participants left the labor market for years, they re-built their confidence in work when they found their work ability on a par with younger workers. -	The job fair provided a platform to access employment information. -	Employment opportunities for older workers were still insufficient in an open job market. Greater collaborative effort including different stakeholders such as employers, employees, and non-governmental organizations are needed to promote age-friendly employment practices. After the programme, the organizer will continue to refer participants to other career training courses and introduce other platforms where they can get further employment information. The program helped us discover the many talents and experiences of older adults who are willing to learn new things and continue contributing to society after retirement. However, not many opportunities are given to them by society. Public education to provide employment is needed. For example, promotion can be done through different mass media, so that different stakeholders, like private sector, the government and non-governmental organizations can be more aware of this issue. Therefore, if we have new program about employment in the future, more job opportunities and training can be provided to older people and age-friendly employment can be promoted. The programme was completed in less than 5 months and many retired older adults had little confidence in their work ability. If more time is allowed, more promotional activities such as talks can be conducted in older adult centres to attract more older participants.